John Terry's England career will be forever framed by the controversies surrounding his captaincy but manager Roy Hodgson will still regret his loss. Terry decided to make a pre-emptive strike on his international future ahead of facing a personal hearing with the Football Association over a disciplinary charge relating to alleged comments to QPR defender Anton Ferdinand. The man twice stripped of the captaincy - but believes the FA's continued pursuit of a charge against him has made his position "untenable." It was only weeks ago that Hodgson was hailing the 31-year-old Chelsea captain as "a warrior" as he limped through England's 5-0 win against Moldova in Chisinau with an ankle injury that kept him out of the subsequent World Cup qualifier against Ukraine. 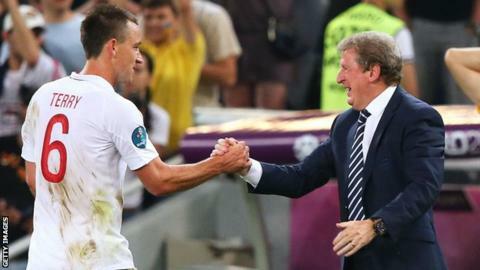 And Hodgson's personal admiration for Terry was made clear when, faced with what he called "a footballing decision", he plumped for Chelsea's captain in a straight choice with Manchester United's Rio Ferdinand for England's Euro 2012 squad. Terry delivered full justification for Hodgson's support by emerging as a stand-out performer in the competition in Poland and Ukraine, especially with a magnificent display as England held Italy at bay in a goalless quarter-final only to lose, inevitably, on penalties. So while Hodgson will understandably throw his support behind his employers in this matter and make preparations for life without a player who won 78 caps in a nine-year England career, he will be sorry to see him cut it short so unceremoniously. Terry's England career has been chequered and his determination to put his body on the line even when suffering injury means he has become an increasingly fragile physical presence in the ranks. He revelled in the role of leader with England, hence his pain at losing the captaincy in February 2010 amid allegations of a relationship with the ex-girlfriend of former club and country team-mate Wayne Bridge, and again earlier this year ahead of the Ferdinand court case. The FA's decision was the catalyst for former coach Fabio Capello to quit and now Terry has walked away from England with their 2014 World Cup qualifying campaign in its infancy. Terry was still an important part of Hodgson's plans, close to an automatic pick when fit, but also a player who was past his prime, very much closer to the end of his career than the beginning and starting to show vital signs of wear and tear. He was still very much of service to Hodgson but the indicators were there that he would soon have to turn to a new generation of England defenders, perhaps before Brazil in two years - should England qualify. Terry is a divisive figure among supporters and players but even his sternest critics - and there were many - would struggle to mount a convincing case against the fact that he was as committed as any player who has played for England in recent years. On this basis alone he will be missed, but he has effectively also taken a decision Hodgson himself would have had to face sooner rather than later. He was a central component of England's defence at Euro 2004 and in the World Cup in Germany two years later - before finding himself in the headlines again for a now infamous press briefing at the so-called "Camp Capello" in Rustenburg, South Africa, during the 2010 World Cup. In arguably the most electrifying and interesting moment of England's wretched campaign, Terry marched in and ferociously tackled every item on the agenda from boredom, team selection and his willingness to tackle Capello on any matters he felt needed correcting. Terry was accused by some - wrongly in my opinion - of mounting a thinly-disguised coup against Capello and attempting to reclaim the captaincy in all but name. His only error in my view was ordering Capello to pick his then Chelsea team-mate Joe Cole, not his territory, but other than that he made cogent points. Capello condemned Terry for his mistake but it still appeared to do nothing to lessen the Italian's admiration for him as a player and character. In some quarters, however, it was regarded as compelling evidence that here was a man with too much to say for himself, too keen on buffering his own power base and revelling in his self-styled "Big Man" reputation. "John Terry has retired from international football. He says the FA have made his position untenable. Probably a sensible decision. Whatever you think about John Terry, he always gave his absolute all on the field for England. A strong leader and great defender." It was an image he was never able to fully shed. There was admiration for his deeds for England, but not necessarily love. How much he is missed in the months ahead depends on how defenders such as Chelsea team-mate Gary Cahill, Everton's Phil Jagielka and Manchester City's Joleon Lescott rise to the task. It is also an opportunity, once they regain fitness, for Manchester United pair Chris Smalling and Phil Jones to stake their claim. Until he suffered a dip in form and was then sidelined with fitness problems, Jones was regarded as the heir apparent to Terry. The troubles of the captaincy will always provide the context to Terry's time with England and he may leave a gap that will initially be difficult to fill. England and manager Roy Hodgson have lost a good defender, but not a great one.